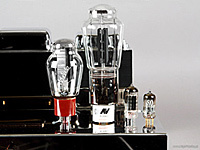 Aleša Vaic Vacuum Tube Technology AV 320B SL (20W). For the test the amplifier was supplied with the AV 320B SL tubes, the RCA input and volume control based on a potentiometer and single loudspeaker terminals. this is a Vaic construction named Super Linear Anodes, based on a proprietary patent. In classic tubes the “cold” end of the heater introduces significant distortion. In this tube this ending is mounted in the anode in four little pits. Those pits are covered by elements containing nickel, visible from the outside. Those eliminate the electron flow in the anode, thus eliminating the emission from the cold end of the heater. Ceramic base with gold plated pins. The amplifier does not have a negative feedback loop and is in fact a dual-mono construction in one enclosure. The only other common part is the power transformer. One of the main advantages of this amplifier against its competition are the split-core type transformers, made by the company itself, which are different than the classic slit ones. Those are wound in England, by people, who specialize in that kind of constructions, and signed an exclusiveness contract with Art Audio. To date we have tested a preamplifier power amplifier set from this company: Art Audio Conductor + Diavolo. Madeleine Peyroux, Bare Bones, Rounder/Universal Music Japan, UCCU-1188, CD. Vivaldi, Laudate Pueri, Magda Kalmar/LFCO, Hungaroton, HCD 11632, CD. Cecilia Bartoli, Opera Proibita, Decca, 475 7029, CD. Kathleen Battle, Grace, Sony Classical/Sony Music Japan, SICC-20023, Blu-spec CD. Firenze 1616, Le Poème Harmonique, dyr. Vincent Dumestre, Alpha 120, CD. Milt Jackson Sextet, Invitation, Riverside/Mobile Fidelity, UDSACD 2031, ACD/CD; review HERE. Denielsson/Dell/Landgren, Salzau Music On The Water, ACT Music + Vision, ACT 9445-2, CD; review HERE. Depeche Mode, Sounds Of The Universe, Mute/EMI Music Japan, TOCP-66878, CD+DVD; review HERE. Jim Hall Trio, ”These Rooms”, Denon, CY-30002, CD. Julie London, Around Midnight, Liberty/EMI Music Japan, TOCJ-90026, HQCD. Akiko Grace, Momentum, Savoy/Columbia Music Entertainment, COCB-53547, CD. Before I switch to the test I want to digress a bit. This is not that I just want to talk, but to set the internal “zoom” to that, what is most important in this review. One of the main abilities in the system construction is to choose the individual components – electronics, loudspeakers, cables, accessories, etc – to have them sound in the optimal way, what will make the whole be more valuable than the simple sum of its elements. This is something impossible in mathematics, also in logic, but quite basic in audio. This point of view, heretic in terms of common sense, is necessary, if we want MUSIC to be the result of combining the one and the other. Because audio is a sphere where the result is important, and not the means of achieving it. And we talk about synergy. What is that? This is a certain “attribute” of the sound, a way of sounding, that brings satisfaction, that allows us to forget we are listening to a mechanical reproduction, and that it does not have anything in common with live musicians. This is about the “illusion” of their presence in our room. And to achieve that, we need to have the knowledge and skill to combine the individual components – a skill very similar to cooking. One of the rules of “synergizing” is compensating of the weaknesses of one component with the assets of another, and in general, compensating of one with the other, the flaws with strong points. The easiest example of this is related to the tonal balance: if the system is a slightly “thin”, lacks the bass foundation, then we try to pair it with loudspeakers with bigger bass than usual, and cabling with the same character. This is what is commonly done and works well. But we cannot forget, that this is just compensating for one flaw with another. But unbelievable results can be achieved doing that, and it has to be admitted, that in the basic, mid, and even basic higher price ranges it cannot be done differently – each component from those groups has definite flaws and this cannot be hidden. But it is different in hi-end and top hi-end. There we cannot talk about “flaws”. Although there are no ideal devices, still compared to other components there are “characteristics”, “characters”, etc. and those should not be seen as negative, because everything else is just “nothing”. On the top of today’s audio (this is of course a temporary state, but I need a reference point) we can only juggle with character, make individual choices and there is no place for compensating anything. Because we cannot forget about one basic thing: every flaw (we can define it a visible departure from neutrality and naturality) is just what it is – a shortcoming, and is communicated as a worsening of the sound. So when in a top device there is lack of treble we cannot compensate for that with brighter cables, because we immediately get bright sound. And Jota Sentry shows it perfectly: this is a fantastic, very well tuned amplifier with a sound, which ties in to the best devices of the world, known to me: the power amplifiers Reimyo PAT-777 (test HERE) and Silver Grand Mono Ancient Audio. In terms of timbre it is closer to the first one mentioned, while in terms of speed and resolution – the second one. Now two sentences about power. As it is commonly known, power spoils the man. The higher the power capabilities of an amplifier, the better. I experience this every day with my Luxman M-800A, which seems to have unlimited resources. But when we talk about top hi-end, then it turns out – and this is just my opinion, and not an axiom – the low, and ultra low, powered amplifiers, based on the 300B tube (8W from a single one, or 16W from a parallel setting of two) or 2A3 (3W and 6W respectively) sound best. Only those can deliver the resolution, palpability, speed and breathtaking naturalness, making the reproduced mechanical events almost sound “true”. But there is a price to pay for that: those are low powered amplifiers, and some things cannot be achieved with them. Please do not get me wrong, but one thing has to be put straight from the very beginning: low power is a FLAW. Not a “characteristic”, not something to take for granted, but a SHORTCOMING!!! To reproduce real dynamics and power big, full range loudspeakers lots of juice are needed, and this cannot be overcome. We can of course try to connect to the amplifier some high efficiency loudspeakers (eg. tube loudspeakers), but from my experience this is not an ideal situation, and distortion brought by such speakers is so significant, that it destroys the positive aspects of such a solution. For me the changes of sound in such loudspeakers are quite annoying, and I think, that classic boxes, with modern drivers are much closer to the dream of “ideal” sound. On the other hand, the character of sound of such a set can be incredibly engaging and I absolutely understand people, who choose that. Still I will repeat this: for me this is a step to the side and not forward. This is the reason, that a combination of low power amplifier and high efficiency loudspeaker is only a half-measure. But besides this one thing, I do not see any other flaws. This is the reason, that all strong triodes, like 845 or 211, are not “my” tubes. I am not convinced to those, and I always miss something in their sound – something that the 300B and 2A3 do have. That was also the reason, why I approached the Vaic tubes with some reserve – it is in fact a “beefed-up” 300B, and this means compromise of one kind or another. But not in this case – the Jota Sentry showed my Luxman, how does a complicated, multilayer sound structure, look like, with basic elements, harmonics, etc. The sound of the ART is slightly warmed on the outer edges of the sound spectrum. At least compared with the Luxman and Ancient Audio. But Reimyo – and when we talk about SET - KR Audio Kronzilla SXI sounded warmer and the treble was visible more rounded there. The sound balance for the Jota Sentry was set in an incredibly tasty way. We get a fantastic vividness and very good resolution. Reimyo and Ancient Audio – each in its own way – go a step further, but those are not big differences. Every disc I listened to had its own audible character, the differentiation was beautiful, but yet the less well made discs were not additionally penalized. You can hear the lesser dynamics, problems with resolution of those recordings, but first we concentrate on the wealth of harmonics, splendidly designed space and bass. Yes – bass is incredible in this amplifier. I mentioned power in my previous paragraph: this is probably the only tube with more than 10W of power, where this was achieved without audible side effects. And 20W is quite a lot, and my Dobermann sounded clean with such an amplifier for the first time, without distortion and with a satisfactory sound level. When I tested the Reimyo PAT-777 I did mention, that 8W is a bit too little for the Polish loudspeakers. The Jota Sentry on the other hand, handled them well. Under one condition: everything what is before it in the chain must be high classed. Now I will call upon that, what I wrote in the beginning of this test: this is not an amplifier, which can be “bettered” with anything. It shows the truth, and only on the highest level the character of cables and electronics can influence the sound in a positive way. The Jota Sentry sounded brilliantly, really brilliantly with the Tara Labs The Zero and The 0.8 cables. Especially the first, absurdly expensive cable, made changes I did not know what to think about. First of all, with the Zero in the sound path, everything could be set louder. My Harpia distort first in the midrange. When I played the ART with Oyaide PA-02 TR interconnects (I have long runs, and sometimes, when I have some problems in positioning the devices, I use them) the sound was very nice, but the disc of Danielsson and Salzau, when the trombone entered, it was quickly distorted. The sound level of this instrument, obviously captured very close, and without any compressors, is exceptional, even when the musician plays quietly. I remembered then about the Tara, which was just there, in its casing. And that was it! The distortion disappeared momentarily and everything could be turned on louder than before. And yet, The Zero promotes the midrange, boost it a bit, and it should be a catastrophe when paired with the Jota. And yet – it was fantastic! But let’s return to the bass: the amplifier sound with a phenomenally differentiated, very low going bass with significant strength. There is no such control, like the one with the EVO402 Krell or the mentioned Luxman. But I did not feel any discomfort there. And still the Dobermann go very far down and do not compress anything. Yet the analog synthesizers from the disc Sounds Of The Universe Depeche Mode, and the fantastic piano Akiko Grace (I recommend this disc!!! It is available on www.CDjapan.co.jp with the disc Illume in complement) sounded in a full, absolutely satisfying way, much better, than 99% of other tube amplifiers! The sound stage made an equally big impression. It turned out, that the elements in counter-phase are on many more discs, than I remembered. The sound stage envelopes the listener. Its depth is big, although Reimyo showed some extra here and the Ancient much more. The Jota Sentry builds a “bubble” around the listener. There is no such precise definition of the planes, and instruments within those planes, like from the mentioned Silver Grand Mono. But, like I say, this is just another vision of that, what is on the discs (and no one of us knows, and will ever know, how it should be in reality, we can only make an assumption, and look for some constant elements). In the sound elements of high energy dominated. So, when we had a strong vocal in the middle, and one instrument to each side, then those three elements were dominating. This is why I lost my self on discs with vocalists – in jazz as well as with classical music. Because the voices sound very realistically. They have a very nice structure, palpability and splendid timbre. I could wish for better drawing of their sides and backs, but you probably cannot have everything. Jota Sentry is a fantastic amplifier and I congratulate all its owners! Its flaws are related to its low power (yes) and slight rounding of the treble and bass. But a really faint rounding. Also the resolution could be a tad better, but you would have to pay much more for that. And one more thing – the power switch is not really accessible and there is no possibility to remote control the device by a trigger. So I think it is worth to order a version, with the power switch on the side. 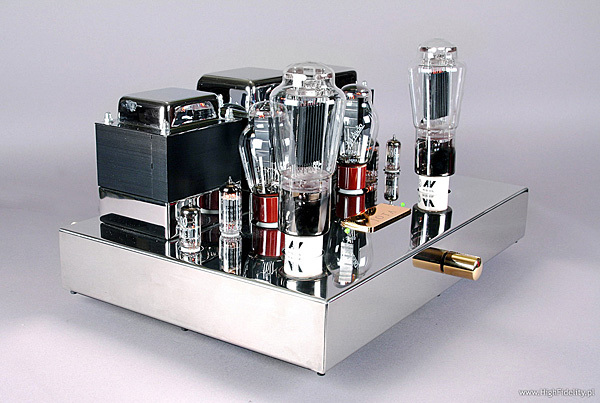 The Art Audio Jota Sentry is a classic SET (Single Ended Triode) amplifier. The audio path is built based on three tubes – two double triodes in the input and control stage and a power triode in the power stage. On the input we have a double triode E88CC by Philips, in the splendid SQ version (this is one of the best versions of this tube I heard), and behind those we have a further double triode, 12BH7A EH made by Electro-Harmonix, working as a cathode follower and output tube driver. The power stage consists of big power tubes Aleša Vaic Vacuum Tube Technology AV 320B SL. The tubes are placed a bit differently than usual, the power tubes are in the front, while the input tubes in the back, just next to the output transformers. This is good, because the sound path is shortened that way. However for the tested amplifier this does not have such an impact, as it is equipped in a volume control. This is a high quality switch with ultra-precise resistors – one of the best constructions of that kind. Such controller allows resigning form a preamplifier and connecting the amplifier directly to the output from the CD player. In my system however, the Jota Sentry sounded better with an external preamplifier – both my Leben RS-28CX, as well as the Polaris II Ayon showed, that the Art can do more. Directly from CD the sound was clean and resolved, but not very saturated and dynamically flat – I do not like such way of sounding. And this makes the sound path longer. Fortunately, the amplifier can be ordered without the controller. I mentioned the output transformers – those were designed by Art Audio and made exclusively for them in one of British factories. A special design allowed achieving an extended frequency response and low distortion at high currents. Between those two there is a third transformer, a big one, supplying power. In front of it we see the rectifying tubes, separate for each channel – the model 274B, with the bulb resembling the 300B. All transformers have chrome plated covers, which do not only shield, but also improve aesthetics. The enclosure is silver in color, made from polish stainless steel. On the back we see large heat sinks for voltage stabilizers, a singular RCA input, a pair of loudspeaker terminals (those are single, but on request other configuration is possible) which are not especially worked out – I would order a WBT equipped amplifier. The whole circuit is built on a PCB. We will find some high class elements there, like precision, high power resistors, coupling capacitors from Hovland (Musicap) and nice power supplies. It turns out, that the secondary windings for both channels power and preamplifier sections are separately wound. Hence the amount of filtering capacitors. The device has no global feedback loop. It can be ordered in one of the many versions, like with the power switch on the side (I recommend that! ), with different values for the loudspeaker terminals, different kinds of the volume controller, or without it, different power tubes, etc. There is really a lot of versions to choose from.